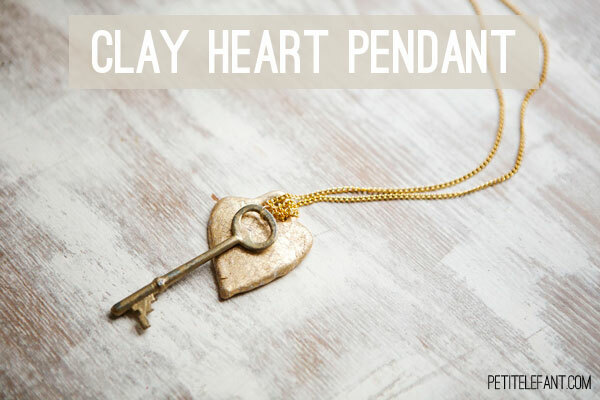 Make your own clay pendant heart necklace with this simple tutorial! 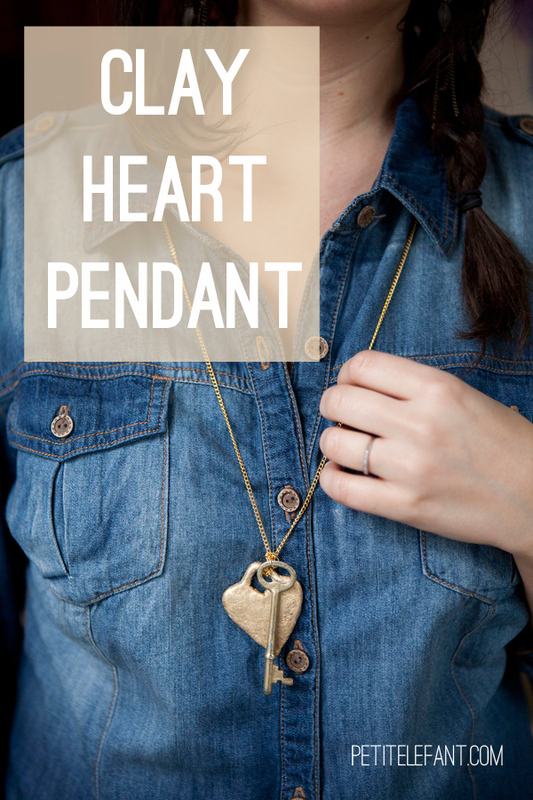 You’ll end up with a hand crafted, super cute heart necklace. Have you started getting ready for Valentine’s Day? You have less than a month! It’s time to start crafting! 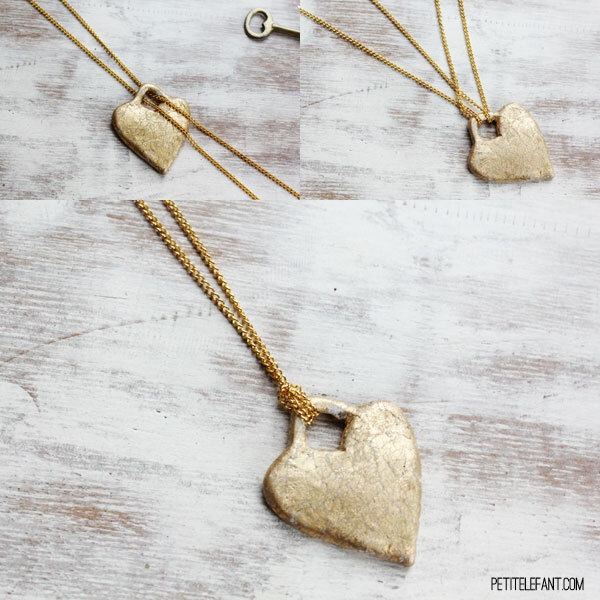 After you sign your kid’s name to a package of Cinderella Valentine’s because she refuses to use anything else, you’ll have plenty of time to figure out what to wear and make this simple clay heart necklace. I recently discovered that you can gold leaf clay. It’s so easy and addictive. 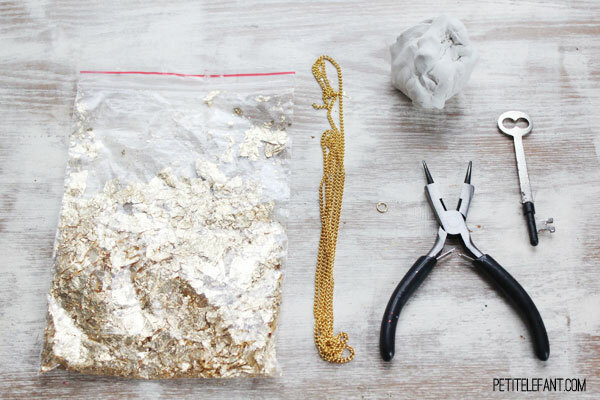 Make one of these and you’ll want to gold leaf everything, trust me. White polymer clay. Make sure you don’t get translucent by mistake. They look the same in the package but the translucent bakes up into a weird color. You only need 1 small package. Gold leaf flakes. This stuff is so fun! Gold chain. You can easily use chain from a old necklace too. 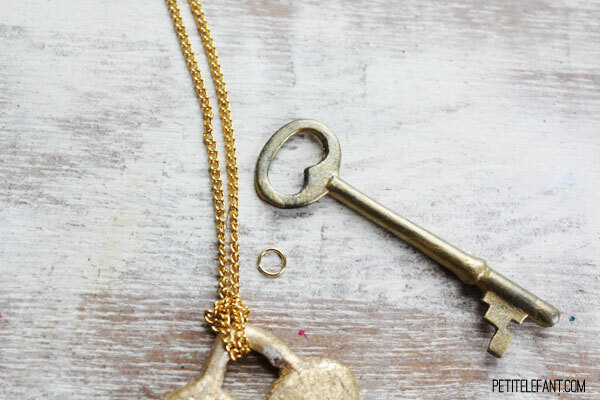 I thought it would be fun to add a skeleton key to the heart charm but you don’t have to. If you do, you’ll need a jump ring and round nose jewelry pliers to attach it. Warm up the clay in your hands and shape it into a heart. 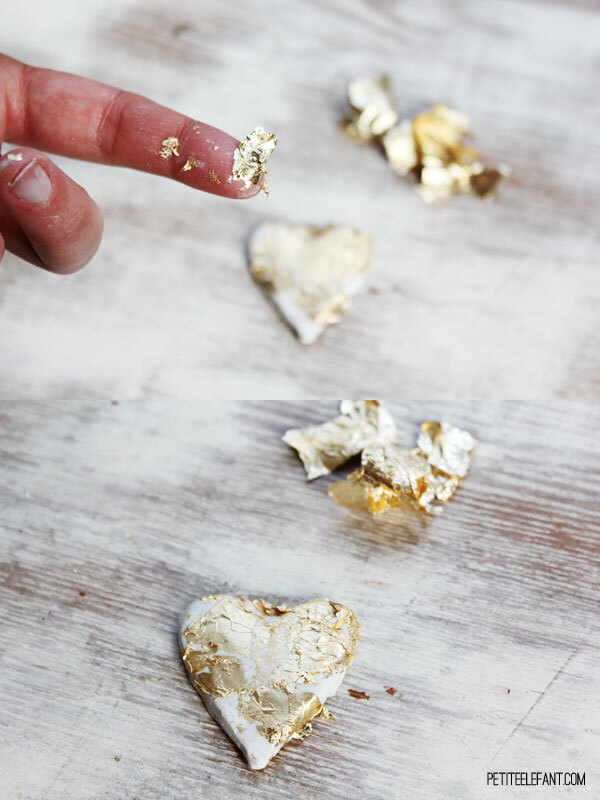 Then use your fingers to apply the gold leaf flakes. Add as much gold leaf as you want. It’s pretty with just a few flakes or completely covered. To make the pendant hook, use a toothpick to add a little loop of clay at the top. Once you have it shaped how you want it look then bake it according to the package instructions. After baking, let it sit for a bit to cool and harden before finishing the project. While the clay is cooling, measure how long you want the necklace to hang down and cut the chain. Fold the chain in half and pull it through the loop at the top of the heart. Pull it back through the other chain loop until tight. 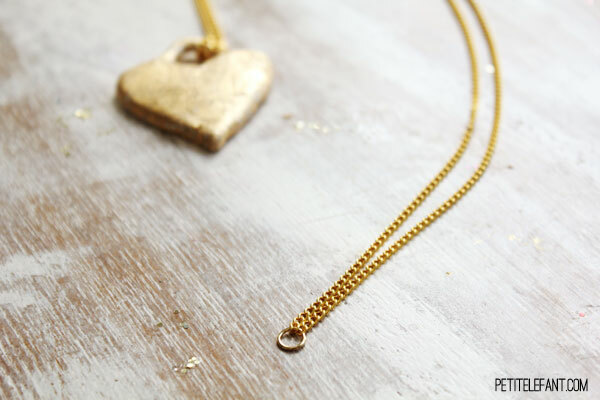 Add a jump ring to attach the ends of the chain together and you can easily slip the necklace over your head. If you’ve having problems with doing the loop above, you can do this step first. It makes it easier to make the loop but you’ll have to be careful to keep the jump ring centered. 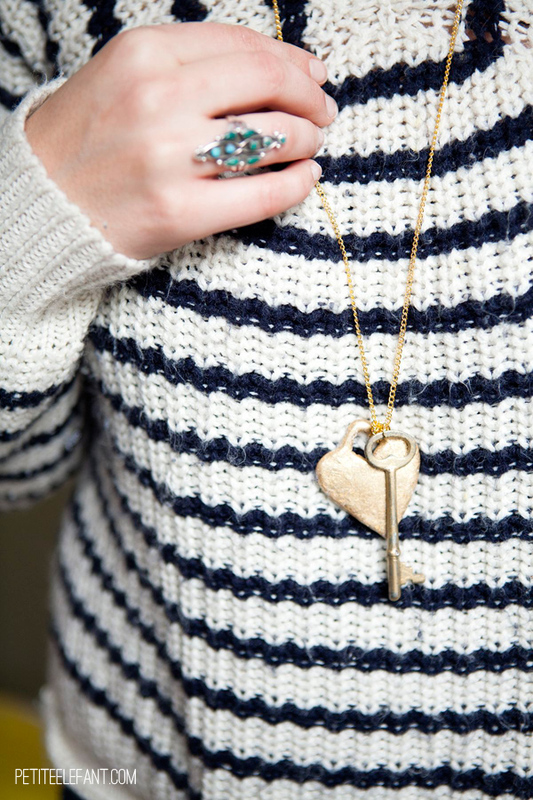 Attach a skeleton key to the chain a few rings above the heart with a small jump ring. What do you think? 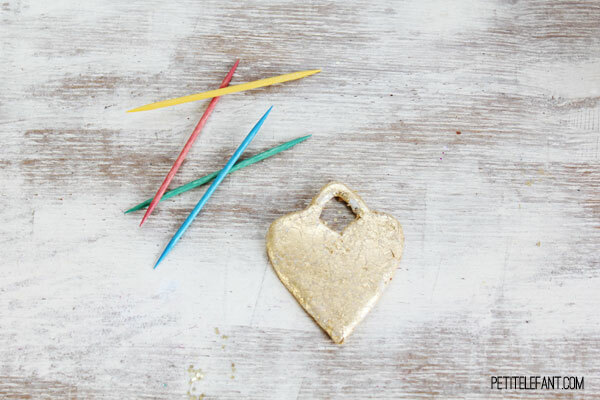 What would you make with gold leaf clay? Just wondering where you buy your clay and where you bought the gold glitter? That sounds like such a fun craft for my daughter’s upcoming 10th birthday party. Thanks! Love your blog!